Plantronics CS530 vs Plantronics CS540 Headset Comparison Review - Headsets Direct, Inc. This is a quick product comparison of the Plantronics CS530 Wireless Headset and the Plantronics CS540 Wireless Headset. So first off, let’s take a look at the Plantronics CS530. This is an over-the-ear model, it weighs 25 grams, it gives you six hours of talk time, and up to 350 feet of distance. This is made for the business world, so this will plug into multi-line phones. When you pull the headset out of the base, there’s a magnetic dock, so you really know it seats in there correctly, so you’re insured that you have a good charge the following day. The base is the charger, and it’s also the brains of the whole unit, because you have compatibility switch settings, and you have a volume controller on the bottom. So these are both part of the Plantronics CS500 Series Headsets, and the base units are identical, so it’s the wearing style of the headset that changes. So let’s take a closer look at the Plantronics CS530 Headset. This headset is very flexible at the top, which makes it very easy to put on. It has have volume up, volume down, and also a mute capability on the headset. There are different sized ear tips available also. As far as putting it on one handed, a matter of seconds, and it’s on. On the mic position, you want the mic roughly a quarter of an inch away from the edge in your mouth. 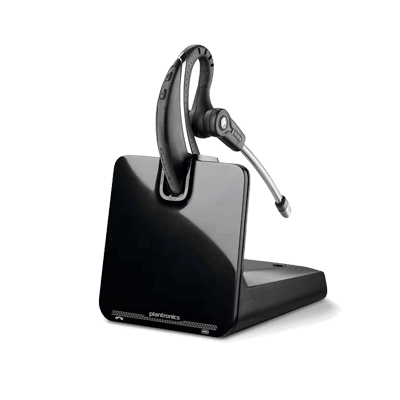 If you’re using a Plantronics HL10 Handset Lifter or EHS cable, it is best if you work with a Plantronics authorized distributor. We can work out which EHS cable you need, because it’s a little tricky. There are many different models of phones out there, and you need a specific cable for specific phones. When you are using an EHS cable and a call comes in, it rings in your headset, and you simply push the on/off button (the call control button), and it takes the call. So you can be up to 350 feet away from your phone and take calls, and that is really important because you’re not missing calls to voice mail, so it’s a great way to be more productive. You’re not missing calls and having to call people back and play phone tag all day. So again, that’s the advantage of using the EHS cable or Plantronics HL10 Lifter, and that ties in with the call control button. So again, this is the CS530 Wireless Headset. Very light weight at 25 grams, and everything fits behind your ear. One negative to this headset is the battery is in the headset, but it’s not replaceable, so if you find in a year or two the battery life talk time is just not what it used to be, you’ll need to get with a Plantronics authorized distributor and have the entire headset replaced, which contains the battery. That will get you a fresh headset, a fresh battery, and up and going again. So again that’s the Plantronics CS530 Wireless Headset. Now let’s take a look at the Plantronics CS540 Headset. Again this headset has the exact same configuration for the base. So you have your settings on the bottom. It’s the magnetic base again, so it really seats in there well. The CS540 Wireless Headset is a convertible headset, so it also comes with a headband, but for this comparison, I just want to compare over-the-ear versions to keep the comparison simple. You have the ear loops; there are different sizes ear loops available. You have the ear gel so you can really find something that fits comfortably for you. You have volume up, volume down, and mute capabilities. On the side is the call control, which works the exact same way with the Plantronics HL10 lifter and EHS cable. One really great thing about the CS540 is the ear tip and ear loop in the speaker portion actually rotate and pivot, so that means you can get a really good fit. The Plantronics CS540 has a replaceable battery, so you pop the cover off, and in a matter of seconds you can change the battery. So that is an advantage of the Plantronics CS540. To put it on, it goes easily over your ear. You put the ear gel in your ear, and with the speaker mechanism, you can rotate the speaker in and out, and you can quickly get it right where you want it to be, close to your mouth, and you’re ready to go. So the biggest difference between these two headsets; the CS540 Wireless Headset rests on the outside of your ear, and the Plantronics CS530 Wireless Headset goes behind your ear. So these are two really good headsets. You’re comparing 21 grams of weight, seven hours of talk time with the CS540 Headset, your CS530 Headset is 25 grams and six hours, so they are virtually identical. The main difference being the speaker battery on the side versus behind your ear. They both have a one-year warranty, so it’s hard to go wrong with either version. I think it really comes down to comparing if you want the headset to fit behind your ear, or if you want it on the outside edge of your ear. 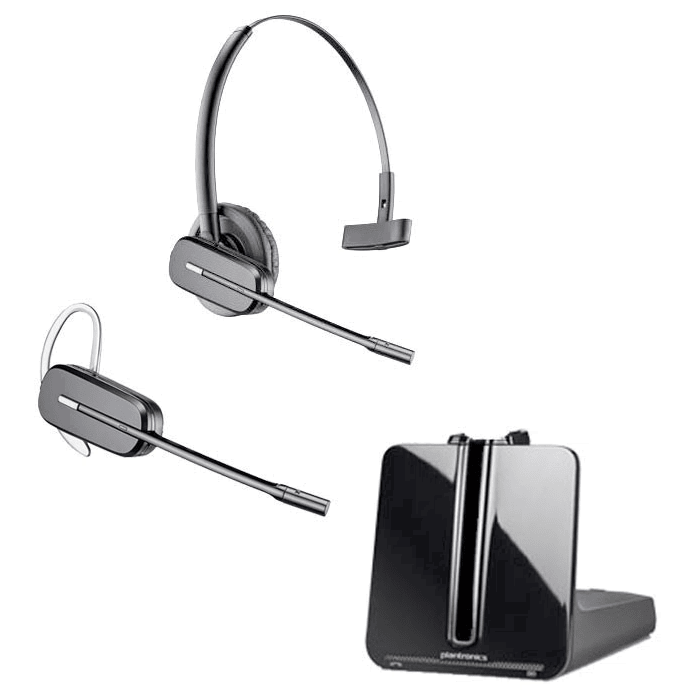 If you have questions on these headsets, or anything else, please give us a call at Headsets Direct 1-800-914-7996, or visit us online at Headsetsdirect.com. Thank You.